Exposing one of his works in nature was the realization of the greatest dreams of Constantin Brancusi. The first time he exposed the column, made only by two identical modules in a rhombus shape, was at the show in the Tuileries, in 1926, entitled Endless Column. 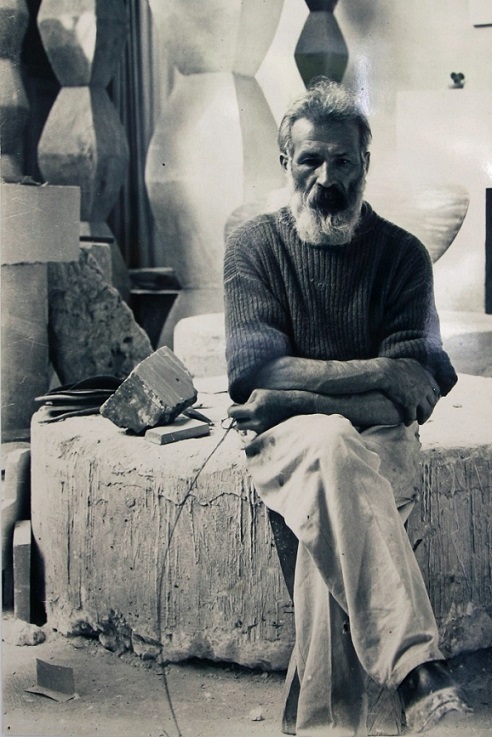 In the same year, Brancusi lives a big joy to see his work exhibited in the garden of a friend, the photographer Edward Steichen, in Voulangis. It's the first time that the column takes the form of a true work of art. With its seven meters height, consisting of nine whole modules and two half modules, the column emerged solemn in the center of the park. A few months later, Edward Steichen had to return in the United States and Brancusi had to recover the column from the park. This experience has given him the courage to dream that one day will find the right place to emerge a column of a considerable size. His dream came truth only ten years later, in 1937-1938, when it is given the project of the column as a monument in memory of the fallen soldiers in World War I, on the Jiu Valley. The proposal was received with great joy by Brancusi considering he wanted to do something that remained in the memory of his nation, such as a monument. The Endless Column of Targu Jiu was built of stainless steel, composed of fifteen entire rhomboid modules and two half modules, with a height of almost thirty meters. The artist has lived intensely the construction’s development and at the project implementation has worked with the engineer Stefan Georgescu-Gorjan, the son of an old childhood friend. Brancusi was present during the work of the beloved Endless Column and he has recorded various moments of the work, collecting everything in an archive of work in progress. The enthusiasm of his countrymen gave him the courage to expand the project and create a complex of monumental works that will also include The Table of Silence and The Gate of the Kiss, to bring a true tribute to the heroes: admiration, gratitude, meditation and design in the memory of the future generations. The last two monuments were made of stone extracted from the mines of Banpotoc of Transylvania. The column was installed in a park just outside the city, in an open space that gives the impression of exploding from the earth like a trunk that is attracted to the sky. An avenue, also called the Heroes Avenue, connect the column with the park, where are the other two monuments. It's a path to the memory of those who have sacrificed themselves for Romania and the Gate of Kiss is nothing more than just an intermediary step towards the Table of Silence, the true place of meditation. It's an initiatory path capable of purifying those who decide to follow it, in an atmosphere of respect and peace. No documents confirming the presence of Brancusi at the inauguration of the monumental complex of Targu Jiu and this was probably due to the political situation in Europe that was announced the crisis that sparked the Second World War. During a visit to Chicago in 1939, Brancusi has expressed his desire to build a column of monumental dimensions on the shores of Lake Michigan. The column had to be 400 meters high, largest than the Washington Monument and the Empire State Building in New York. Made of stainless steel, the column had to be a building with the apartments, which had to reflect "infinitely" itself in the lake Michigam. The philosophical interpretations of the Column are many and varied, from the esoteric to those of oriental influences, but it was actually the result of the search of perfect balance in the simple forms. 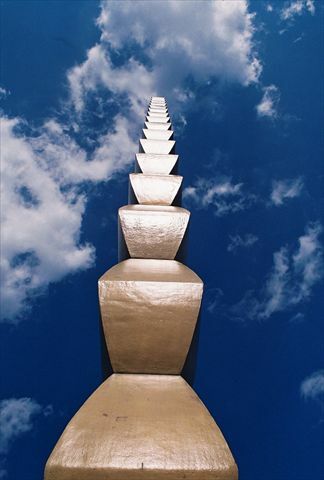 The Endless Column is certainly a representative work of Brancusi leading to heaven a simple structure that is repeated endlessly, but it is also a universal work, a journey within our being. The Endless Column is the central symbolic, a spiritual resuscitation, a return to higher categories, metaphysical, is a work of freedom and hope.